Fermentation. That, of course, is what the title of this post is referring to. Every culture has their versions, and things you may not think of as fermented are in fact just that...beer, bread, yogurt, sour cream, buttermilk, wine, and of course all sorts of vegetable pickles. 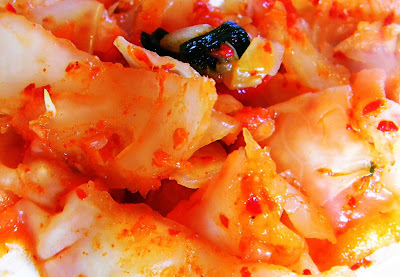 My favorite is kim-chi, or Korean style sauerkraut. Fermented products are very healthy and easy to make...the most difficult thing, I think, is the wait; they can't be rushed. The recipe for the above pictured kim-chi is listed below, and if you'd like to see it being made, click here. To read more about the history and health benefits of these incredible foods--with plenty of recipes--click here. And if you are interested a book on all things fermented, I recommend this book.